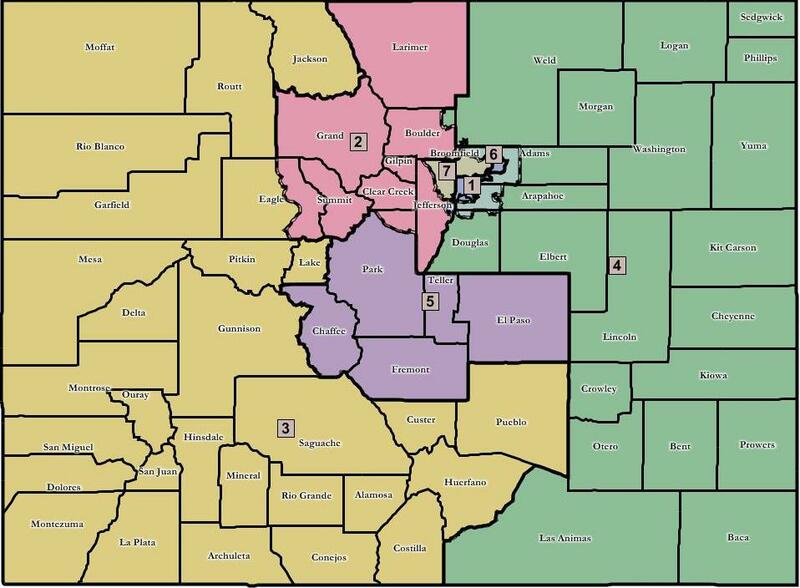 In a surprisingly rapid decision following last Thursday’s oral arguments in challenges to a Democrat-drawn Congressional Redistricting map previously approved by Denver District Court Judge Robert Hyatt, the Colorado Supreme Court announced in a court order issued Monday morning (5 December) that it affirmed Hyatt’s ruling in the lower court and the ‘Moreno South Map’ establishes the boundaries of Colorado’s Congressional districts for the next decade. The Colorado Supreme Court’s ruling, although disappointing to Colorado Republicans (particularly the residents of Douglas and Larimer counties) hardly comes as a surprise – Colorado Democrats carefully prepared the conditions for their victory on Congressional Redistricting as part of a long-standing strategy of sending the decision to the courts, where they have traditionally enjoyed a friendly venue. Republicans may not even be able to decry the Colorado Supreme Court’s ruling as purely partisan (contrasting with the situation in the 2003 Salazar v. Davidson congressional redistricting case) or an example of unmitigated judicial activism, since the statutory changes (enabling consideration of purely political factors by the courts) and selective use of testimony may have provided sufficient legal “cover” for the court’s ruling majority to affirm the lower court’s ruling – aside from that pesky constitutional provision (Article V, Section 44) mandating Congressional Redistricting as a legislative, not judicial, responsibility in the first place. Final judgment on the legal merits of the Colorado Supreme Court’s decision in this case (along with knowing the vote count) will have to wait, pending release and review of the actual written ruling (expected in the coming weeks). In any event, the boundaries of Colorado’s Congressional districts are now set for the next decade – there is no further appeal from the Colorado Supreme Court’s ruling in this case. Irrespective of one’s preferences on the congressional district maps, the negative repercussions of manipulating the redistricting process to impose an outcome via the courts are severely damaging to public confidence in our institutions of state government – both legislative and judicial. Legislative abdication of constitutionally-mandated responsibilities reinforces public perception of politicians as feckless and irresponsible (not without reason). Perhaps more importantly, the intentional politicization of the judiciary – increasingly seen as acting as just another category of politician, distinguished from the other branches only by a unique mode of dress (black robes) – is corrosive to our institutions, and undermines the sanctity of the rule of law. Clear The Bench Colorado will, with your support, continue to promote transparency and accountability in the Colorado judiciary, informing the public to increase awareness of the substantial public policy implications of an unrestrained activism and political agendas in the courts. We will continue to work to educate voters and provide information of relevance related to the judicial branch, and to provide useful and substantive evaluations of judicial performance. However, we can’t do it alone – we need your continued support; via your comments (Sound Off!) and, yes, your contributions. Freedom isn’t free –nor is it always easy to be a Citizen, not a subject. Ultimately, though – it’s worth the effort. If there was ever any doubt that the liberal¹ fascists² in the Democrat party will do anything to maintain power, this display of tyranny by the judicial branch removes any question. Think it’s time to move to Utah or Arizona since my once wonderfully red state of Colorado is now being turned into California or New York. Wonder if ever the ‘leaders’ of the GOP (Boehner? puhleeze; Ryan Call and Reinz Priebus? don’t bring a knife to a gunfight) will recognize that there is a war on for the very survival of my nation as it was intended to be and that if they’re not going to fight, they should step aside so someone who will can engage the IslamoLiberals in a fight to the death (that’s not hyperbole – I’m very serious) will take appropriate and necessary actions. ¹ From dictionary.com [caps added]:In the twentieth century, a viewpoint or ideology associated with free political institutions and religious toleration, as well as support for a STRONG ROLE OF GOVERNMENT in REGULATING CAPITALISM and CONSTRUCTING THE WELFARE STATE. ² From wiktionary [caps added]: A political regime, having TOTALITARIAN ASPIRATIONS, ideologically based on a relationship between business and the centralized government, business-AND-GOVERNMENT CONTROL of the market place, repression of criticism or opposition, a leader cult and EXALTING THE STATE and/or religion ABOVE INDIVIDUAL RIGHTS. CTBC’s 2018 Evaluations of Colorado Judicial Performance: Coloradans, Do you Know Your Judge? CTBC Director on Sound Off! Rob the Voter Guy on Sound Off! Copyright © 2018 Clear the Bench Colorado.